You can’t buy your way to the top of the SERPs with shady link campaigns anymore. However, there are more ways than ever before to show Google that yours is the best answer on relevant queries. In these increasingly interactive, visual search results, it is critical that marketers approach search optimization with an understanding of all opportunities to appear on the first page. Optimizing content the way you were five years ago may still earn you a place in the top five or six organic blue links. But today that could put you on the second page – or so far down the mobile results that you don’t have a snowball’s chance in hell of being seen. 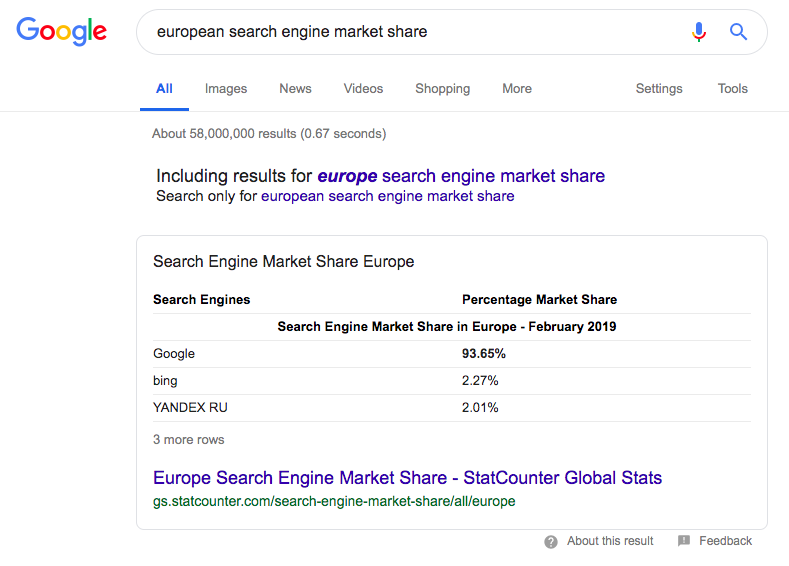 Rich snippets, featured snippets, Map Pack results, Knowledge Graph panels, and more all compete for eyeballs and clicks on the dynamic front page. 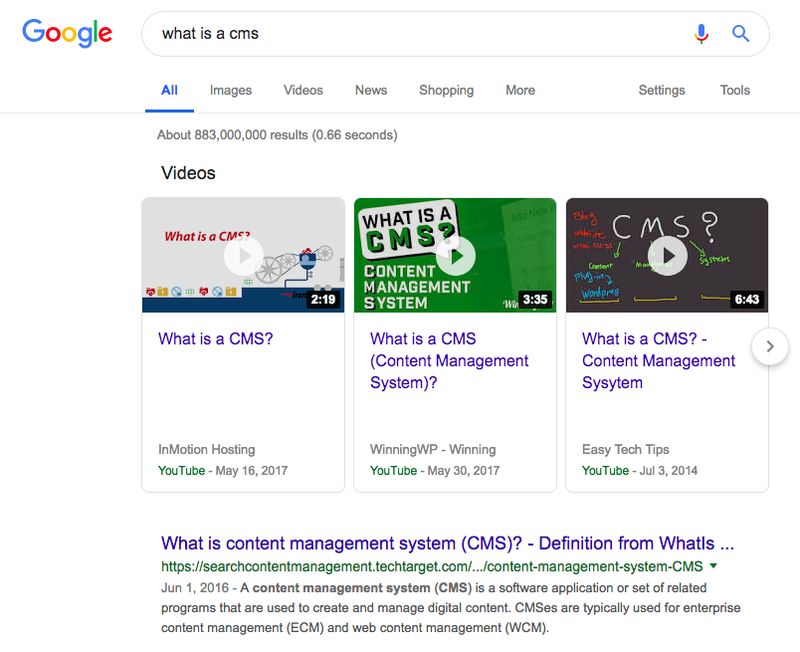 In this post, we’re going to explore the different ways you can appear on Google’s Page 1 by optimizing content for various types of search results. Note that this is in no way comprehensive and is ever-changing, as Google constantly tests and launches new features (and sometimes takes our favorite toys away). Rich snippets are an enhanced organic search result that adds information to a plain text search result and expands it as a result. Rich snippets make your results more dynamic, visible, and engaging. 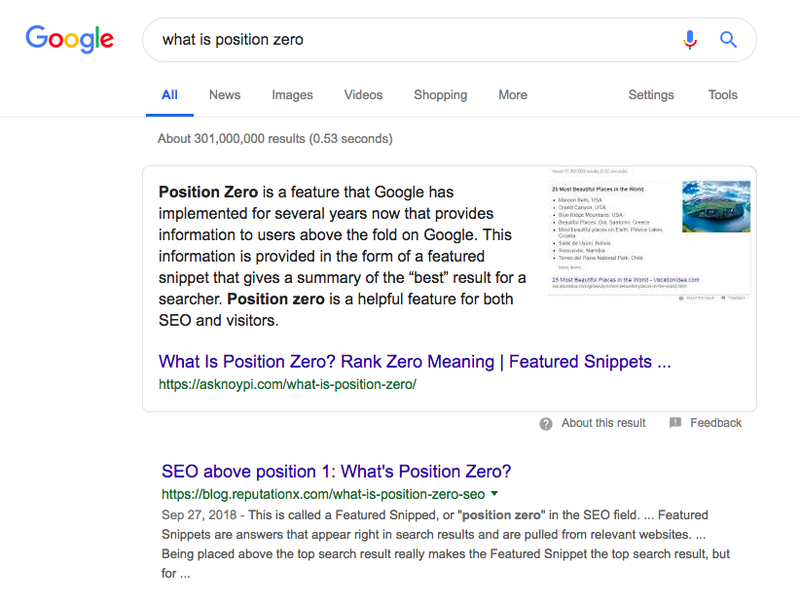 Featured snippets are enhanced answers that appear at the top of search results, in “Position Zero” (sometimes even above paid results). This expanded information card typically answers an informational query and may include text, a numbered list (especially for how-to queries), an image, and more. Position Zero results prominently display the page title and URL of the source of the information, enabling searchers to click through to keep reading. 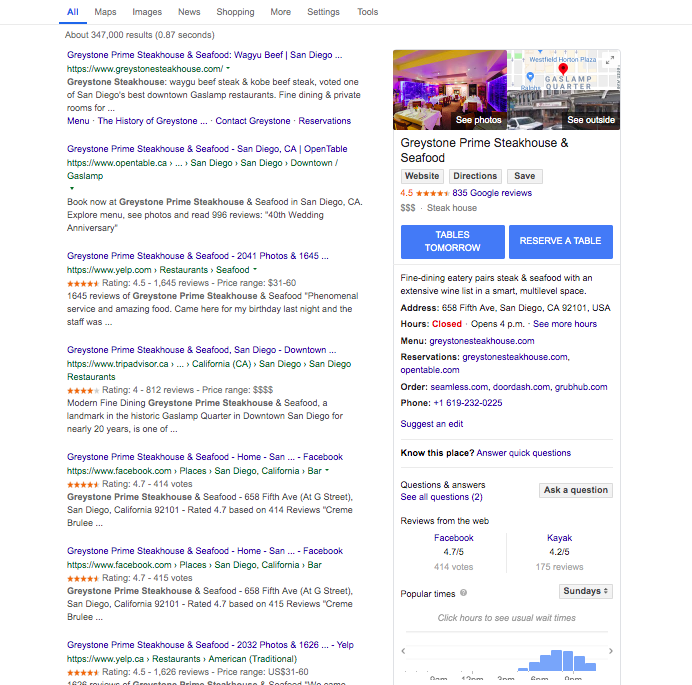 Note that although more than 9 percent of SERPs display a featured snippet, Google won’t display the Local Pack and a Featured Snippet concurrently. It’s important that you’re optimizing for the search results enhancements that make sense within the context of your business goals and searcher intent. Read more about the types of content that dominate Position Zero here. Knowledge Graph is another of the ways Google aims to match results to searcher intent, this time through information curated from a wide variety of sources. It’s worthy of an entire article in itself; Aleh Barysevich wrote a great primer on Knowledge Graph and how it works here if you’d like to learn more. 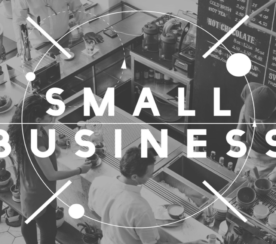 Google My Business helps business owners manage their online presence and powers results in the MapPack, Photos, Business Panel and more. It can feed into Knowledge Graph results, as well. Check out Sam Hollingsworth’s comprehensive how-to on GMB if you’re just getting started or looking for improvements in that area. 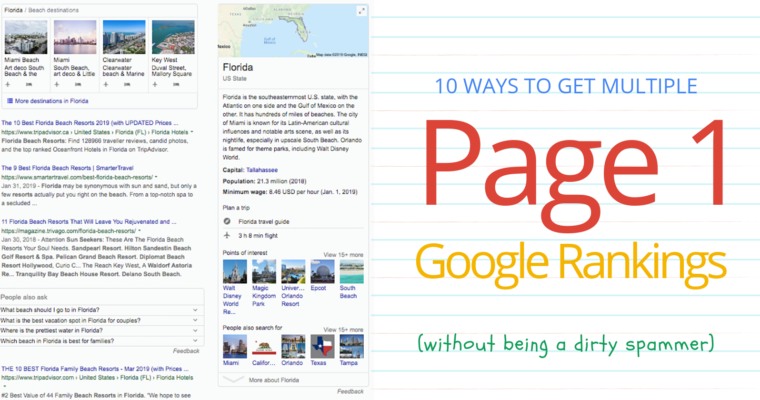 Here are 10 ways you can get more Page 1 – and Position 1 or even the coveted Position Zero – results in Google. For each one, you’ll find tips and resources to help you optimize for that type of result (although this is in no way a guarantee that you’ll achieve it). Achieving the top plain text organic search result in Google is more difficult than ever before. Not only is search extremely competitive, but plain blue links are becoming rare. Often, Google opts to display another type of result – one that is more engaging or offers increased information and functionality, as we’ll see below. Answer a searcher’s need for information. Be superior in every way. Seriously, that’s what it takes. Until last year, videos appeared as a thumbnail alongside the blue text link. Now, Google organizes them into a carousel that may appear above all other results. Help searchers and search engines understand your video’s content with relevant, quality titles, descriptions, and tags. Make sure you have a strategy for managing comments. Simply turning them off takes away a valuable search signal. 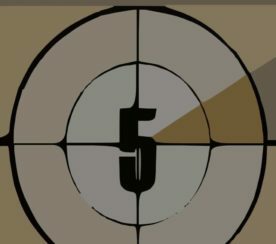 See Sam Hollingsworth’s column on YouTube video optimization for more. The product carousel has been around since about 2014, but little is known about how to actually optimize for it. There is some speculation that it has less to do with schema markup than one might expect, and also that branded search volume may play a role. You can mark up single product pages, or shopping aggregator pages that list one product with various seller options. 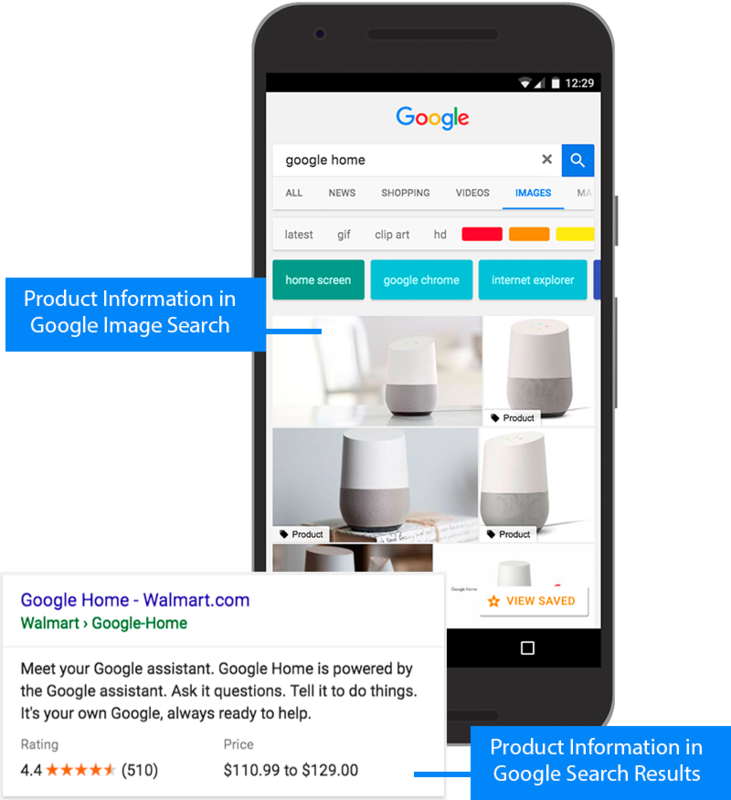 On mobile, product markup enables a badge that displays on the product image in Google Image Search. See Google’s markup requirements for all Carousels. 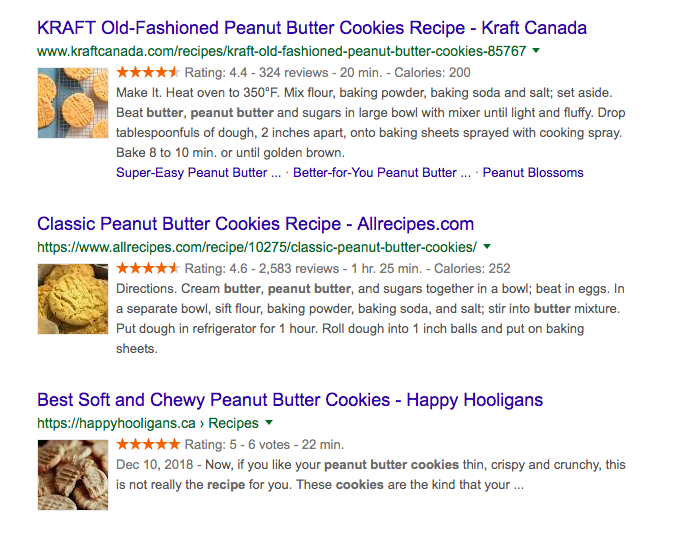 Mark up your product pages so users can see price, availability, and review ratings right on Search results. 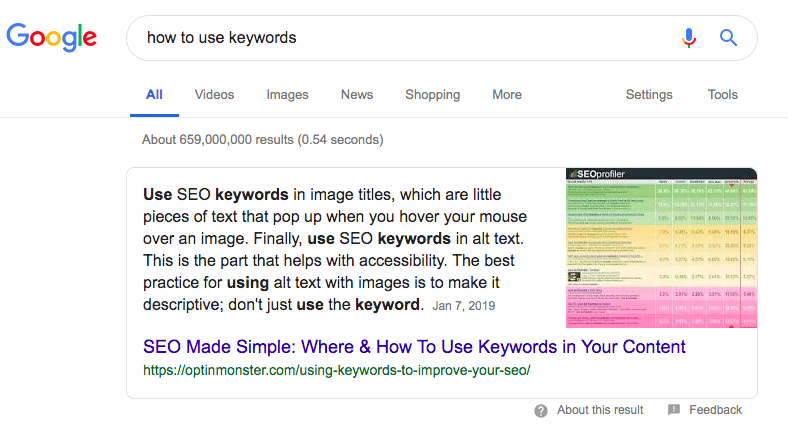 A type of featured snippet that displays approximately 50 words of text, the page title and URL, and a featured image thumbnail. Paragraph snippets are an excellent opportunity to get more eyes on your thought leadership material. Answer informational queries relevant to your business and its products or services. Keep this paragraph format and a simple Q&A approach in mind as you create content you hope to rank on this type of result. Do the legwork of researching what questions people have and see what results come up. Are there opportunities where no result renders? Are there results that seem low quality or outdated? Start there and use your learnings from those early efforts with lowest-hanging fruit to target more competitive search terms. Tables can be an effective way to share information or demonstrate concepts. Schema.org estimates that under 50,000 domains are currently using the proper markup to tell search engines there is a table on one of their webpages. This seems like a seriously underutilized content type you could use to take that top spot on informational queries with shareable data. Note that Google initially developed this result for news media. However, as brands increasingly function as publishers and may even tackle timely news stories, this could be an opportunity for businesses, as well. Explore Google’s approach to dataset discovery and find developer resources here. Read more about displaying data tables in search results here. The Top Stories carousel displays the headline, source name, and an expanded image. These results are open to blogs as well as media websites. Proper optimization here can result in your article being automatically converted into an action on the Google Assistant, enabling people to access your content through the voice assistant. Google recommends that you use AMP pages with structured data markup for an enhanced appearance in the Top stories carousel, host carousel of rich results, Visual stories, and rich results in mobile Search results. 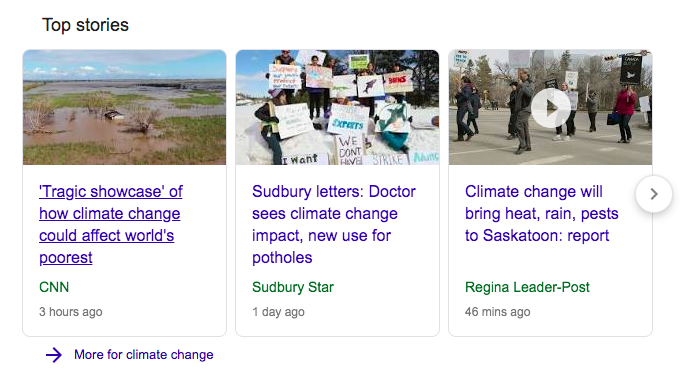 You can still appear in the Top Stories carousel with non-AMP article pages but won’t be optimized for voice search as an action in Google Assistant or have access to features such as logo display. With the proper markup and optimizations, business panels can have a great deal of functionality and interactivity. Not only can searchers find your address, phone number and hours of operation without clicking through to your site, but they may be able to complete actions such as booking a table, placing an order, or making an appointment. Your panel expands as more relevant information is added, making it incredibly hard to miss on both desktop and mobile. Expand your panel as much as possible by populating your GMB profile with descriptive, relevant information to help searchers make a decision about your business. Monitor your GMB dashboard and interact regularly with searchers who leave reviews, ask questions, or otherwise attempt to engage your business. Keep all information up-to-date in order to avoid poor searcher experience (such as directing someone to a closed location) and eroding search engine trust in your brand. Find specific markup to facilitate actions such as reservation taking or online ordering here. 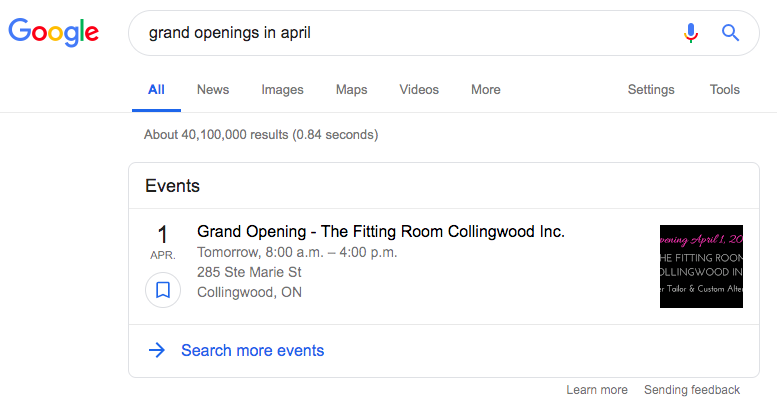 Marking up your events pages helps this information appear in Google Search and Maps results. Searchers can also click through to see more events and filter by type of event. For the occasional event or just a few on your website, use Google’s Data Highlighter. Apply the proper Events markup. When Google finds the proper markups for reviews, it may expand your rich result with a review excerpt or an average combined rating score. Currently, this rich search result type is available for books, local businesses, movies, music, products, and recipes. 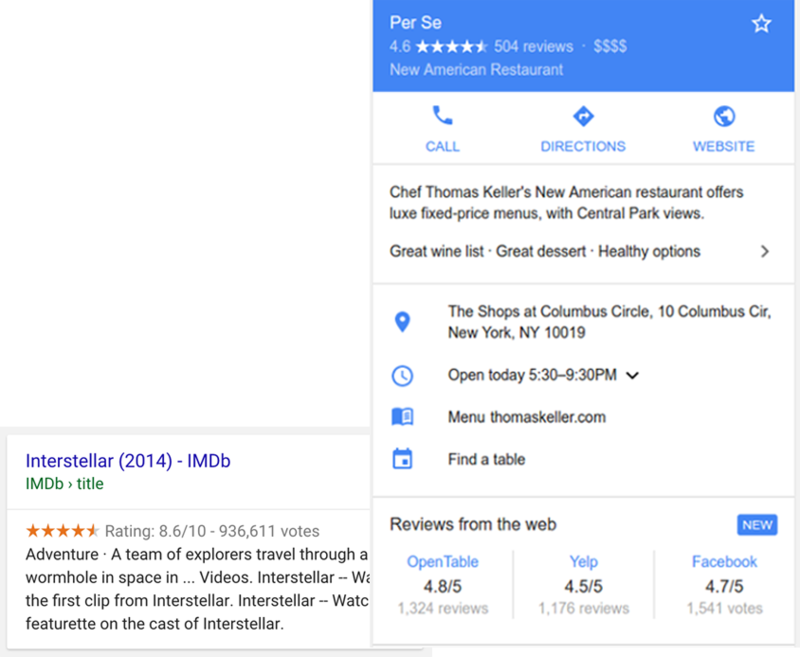 Follow Google’s instructions here for optimization whether you want to add a simple review, embed a review into another schema.org type using its review property, add ratings to your reviews, or add aggregate ratings. Reinforce your branding at every opportunity by ensuring that your logo appears in your business panel and in Search. You would think that making sure your logo is visible is Marketing 101 but according to Schema.org, less than a quarter of a million websites are using this markup. Again, we can see that these features are underutilized, which presents an opportunity to those marketers who take the time to optimize for rich search results. Use a logo that is 112x112px, at minimum, in .jpg, .png, or. gif format. 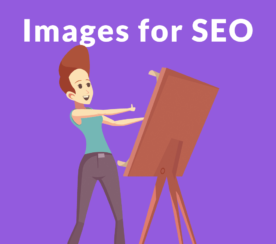 Make sure that the image URL is crawlable and indexable. Follow Google’s structured data guidelines. It’s pretty important to them that you do so, as evidenced by their guide entitled (you guessed it): Follow the structured data guidelines. If you’re just getting started, try out Google’s Structured Data Codelab to experiment with several different types of structured data in a controlled, instructive environment. Use Google’s Rich Results Test to see if your page supports rich results and get recommendations to improve. Avoid being perceived by Google as a structured data spammer by resolving issues and avoiding shady behavior such as marking up content that isn’t visible to users. Run Google’s Rich Result Status Report after implementation and regularly as you continue to optimize your site’s content. You’ll see which rich results Google could or couldn’t read from your site and get troubleshooting information for rich result errors. You can then request a recrawl after you have fixed any problems. These are just a few of the more universally appealing ways to get multiple Page 1 results. There are plenty more, especially once you get into vertical-specific results. Before chasing any one type of result, make sure you understand the opportunity, competition, and searcher intent you hope to get in front of with that specific type of content.